We had our annual Back to School Dinner. Brown bag lunches, like always. Easiest tradition ever and one of of the kid's favorite. The best kind. 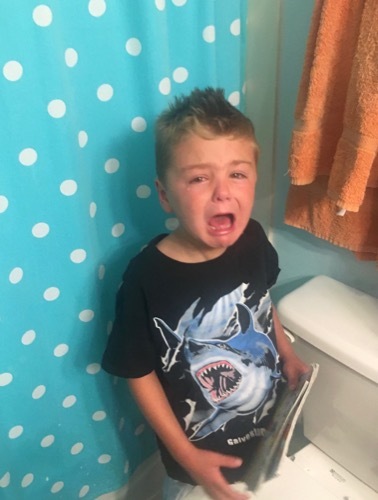 There were LOTS of tears the night before school started. Especially for the 6th grader. Change is hard. 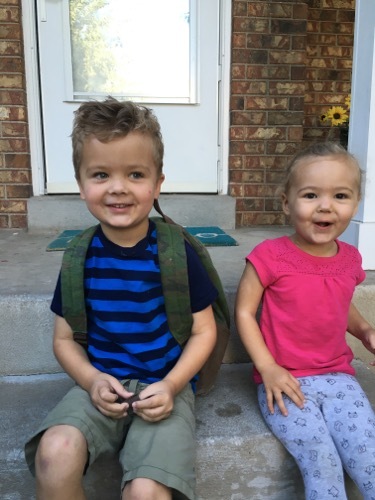 I was worried the morning would be rough, but they luckily got it out the night before and it was mostly smiles. 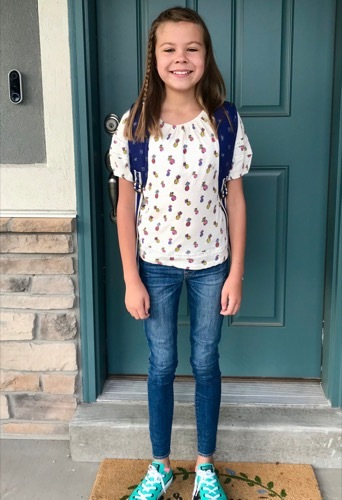 First day of 6th grade!!! 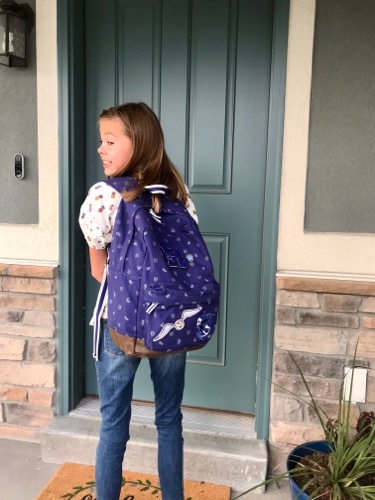 In Utah 6th grade is still in elementary school, so we moved this poor girl away from her friends that she has had since kindergarten for her last year in elementary school. It was heart breaking. 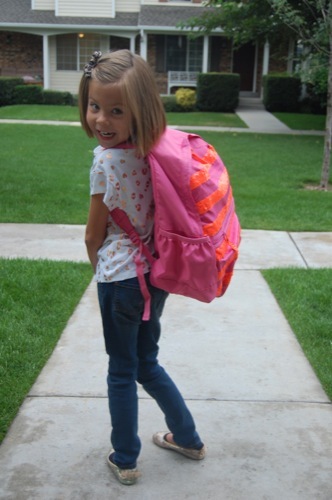 She is always my child that cannot wait to go back to school and this was the first time ever she wasn't. It was a weird feeling for her and hard to wrap her head around. 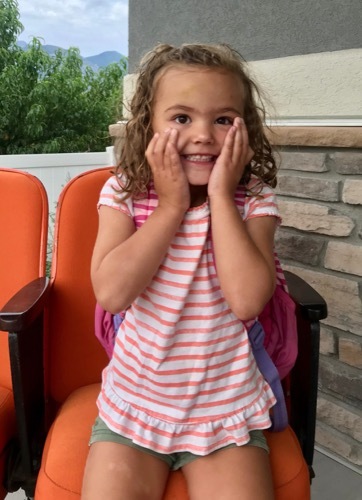 I have been shocked, and pleasantly surprised, with how well this kid handled the move to the new house and now starting at a new school. 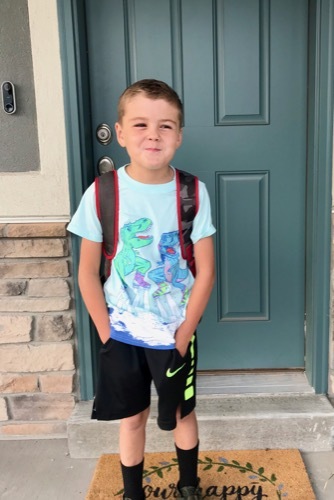 I requested some kids he already knew to be in his class and we had met with his new teacher a few times last school year and had a few school tours with the principal this summer. It paid off, big time. Not that it's been easy, it just hasn't been the all out screaming and rolling on the ground situation that I imagined it would be. Plus, while we were in the midst of sobbing and comforting kids the night before school started, I got a text from his beloved 2nd grade teacher. 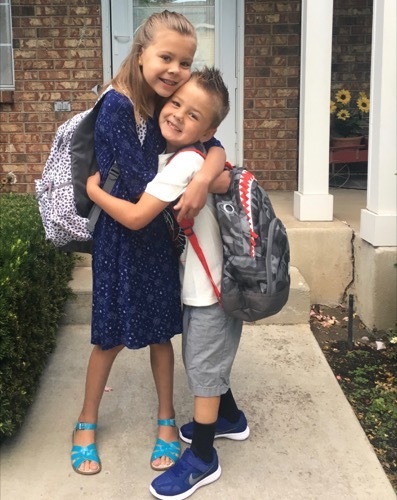 She texted to wish Miles a great first day of school and to tell him that she loves him and knew he'd do great at his new school. of all the kids, Crew has adjusted going to all day school from half day kindergarten the best. He is just loving it. And I am jealous of his teacher. I underestimated the amazingness that is living 1 block from the school. Life changing and the main thing that makes me know I made the right decision not to stay at Suncrest. 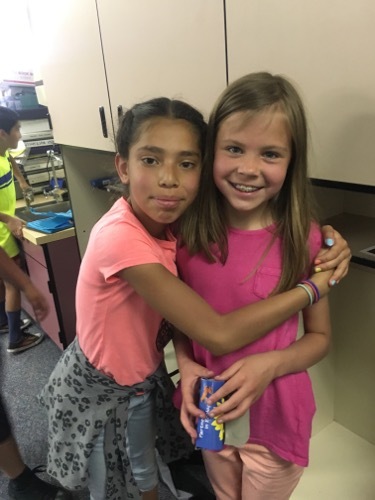 We are learning change is good though and that we are so lucky to get to know more amazing friends and teachers. Although, we still do like to go back to Suncrest and hug and visit some our old beloved teachers. It makes my heart hurt sometimes, but our new school is pretty awesome too and it is growing on us. I didn't have time to be sad though, Ruby had big plans for our day together. 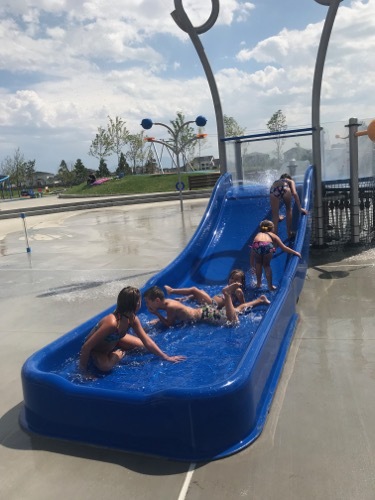 We celebrated an awesome first day of school with some of our old and bestest friends from Suncrest, by going to a splash pad. 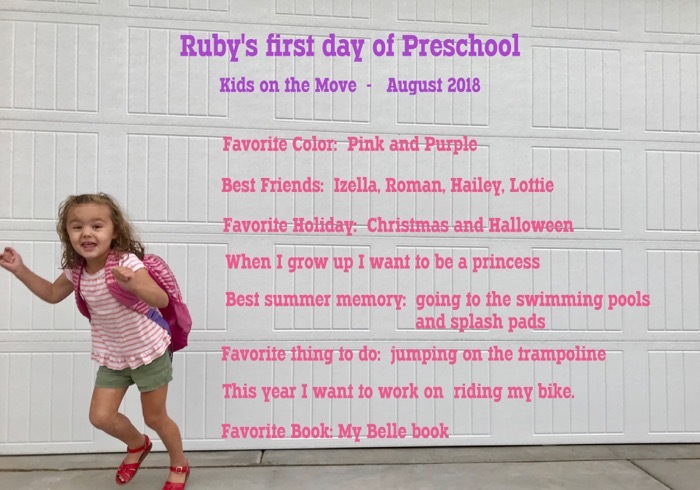 And then Ruby started preschool the next day. 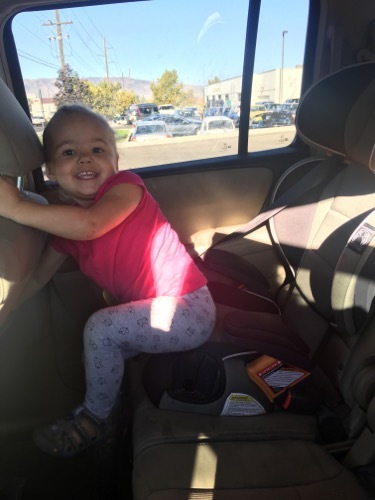 She loves it, even though she still cries almost everyday at drop off. Paul thought it'd be a good idea to go out to breakfast after we dropped Ruby off. I just wanted to go home and cry in private. I am grateful for amazing teachers, staff, and new friends that are helping to make this another amazing school year. This was the only pic I could get of Ruby. 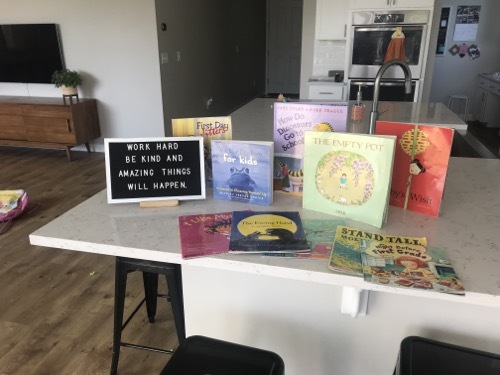 The kids are doing so great and so are you!! Love Ruby's photo by the garage, she can only hold still for so long. My favorite is that Macey and Crew's best summer memories were coming to Nana & Pop Pop's!!!! 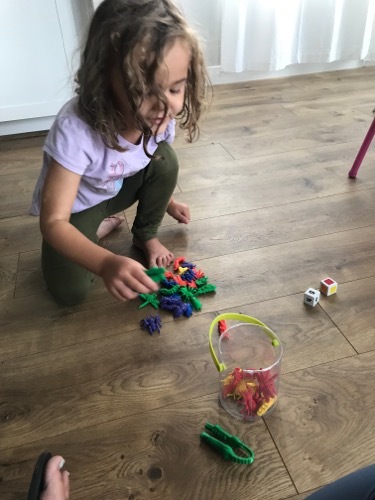 I love Ruby's garage run-away picture! I can't wait to meet her IRL. I am over here sympathizing with you. It's great to get a big yard and a beautiful new house, but there are definitely trade-offs. For years now, I've been looking forward to Todd's military retirement - and our supposed move to Utah afterwards. But lately I've been just loving our ward (finally!) and feeling super comfortable at my kids' school. Like you said, knowing all the teachers, and everyone on campus knowing our family, and all my kids' names. It's a great feeling, and I've realized I don't necessarily want to give that up. Also, we've got great weather out here. We just do. It's, like, 20 degrees warmer here now than it is at my mom's house in Utah right now. So I'm feeling a little nuts for daydreaming about moving away. Anyway, I'm just saying your regrets/things you're missing/whatever are totally normal and I love you. 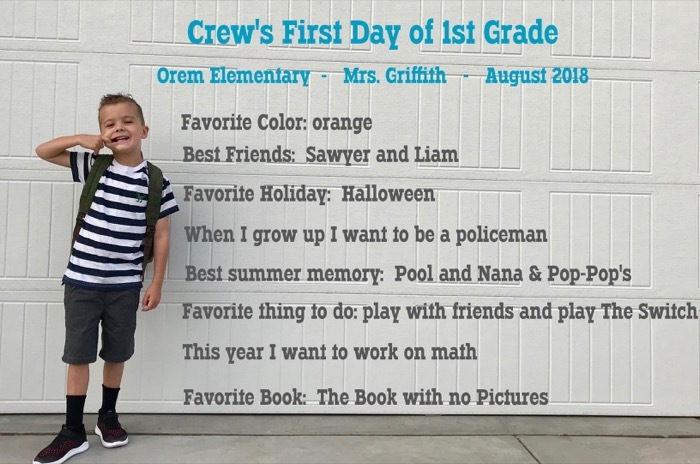 Also, I thought it was really funny how you explained about Paul not understanding your first day of school cry tradition. Ha! 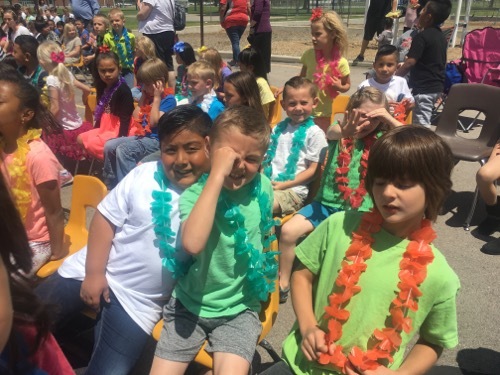 The kids had a blast the last few weeks of school. 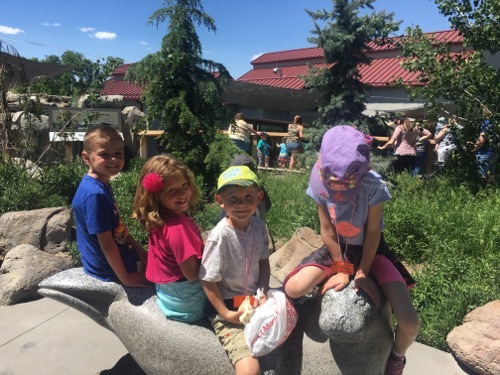 I got to go with the 1st grade to the zoo. 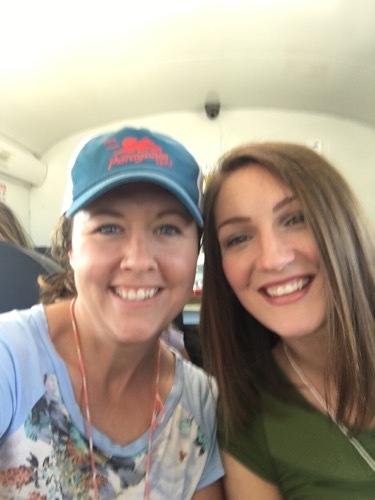 I even got to sit by one of my best friends on the bus ride. 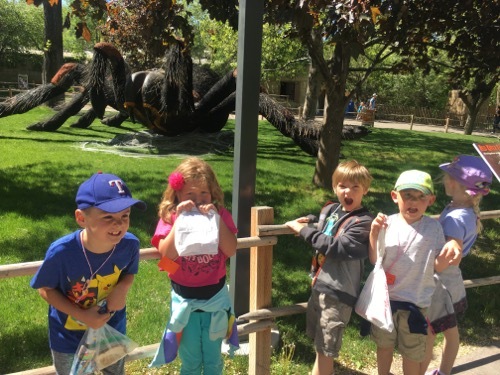 I got the cutest group of Miles' friends and it has been my favorite field trip I've gotten to go on by far. I just love these little first graders. 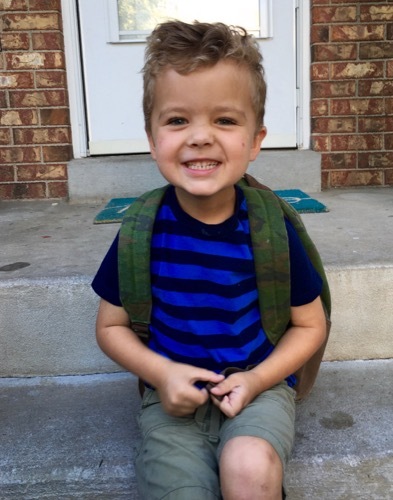 I don't know if either of us are ready for him to start kindergarten, but I know he's going to rock it. I just don't want to part with him everyday. 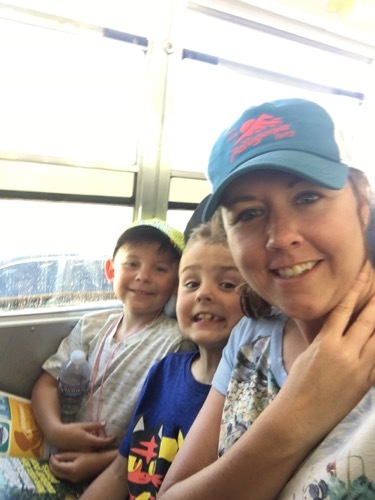 M&M had field day, soak your teacher, dance festival, and the 4th grade did an entire Harry Potter themed week. Good times. We had the best teachers ever, again! 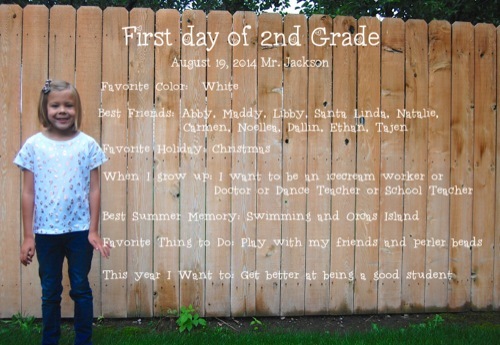 As you know I was terrified about first grade with Miles...terrified. 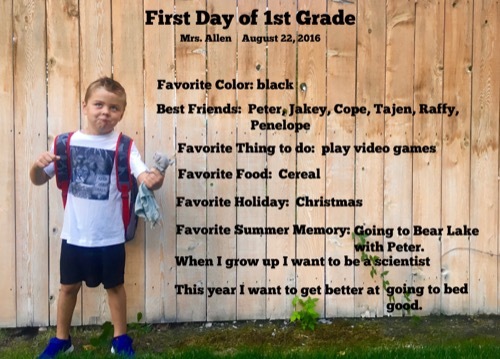 But Mrs. Allen was the absolute perfect fit for this kid. When I would talk to her about Miles related things, she'd just look at me like I was crazy, because that was not the Miles she saw in class. :) She was soft spoken, kind, fun, positive, and patient. I told her I'd send his 2nd grade teacher to her for tips. Macey lucked out again and got Mrs. Tingey. 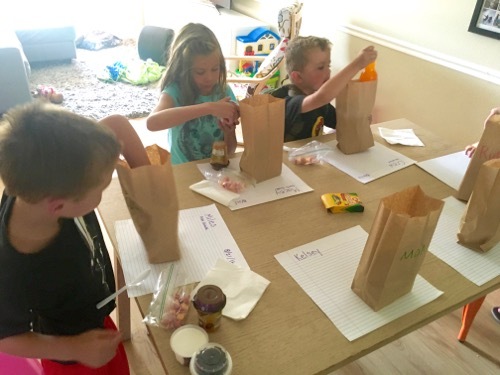 The year was filled with awesome science experiments and all things Harry Potter. 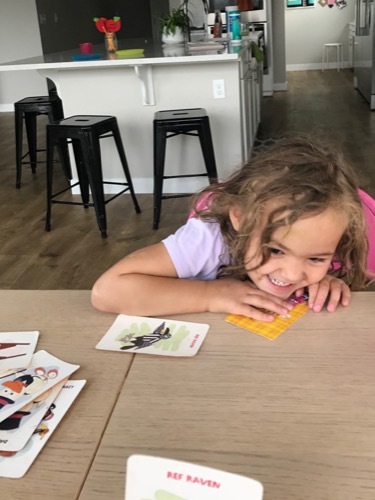 She really help Macey expand her love of reading and learning. We are so sad she's moving and won't be at our school anymore. If next year goes half as well as this year, it will be a good year. 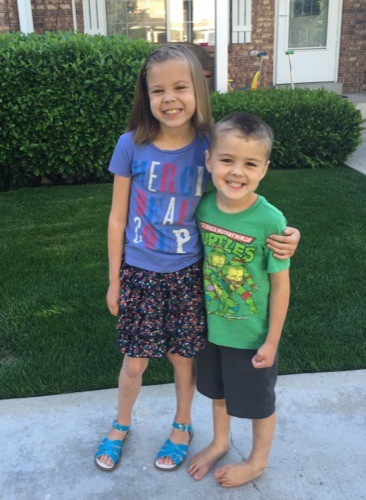 :) And yes, I'm a bit heartbroken over the fact that these 2 will be 2nd and 5th graders next year. It just doesn't seem real. We did our normal last day of school things. 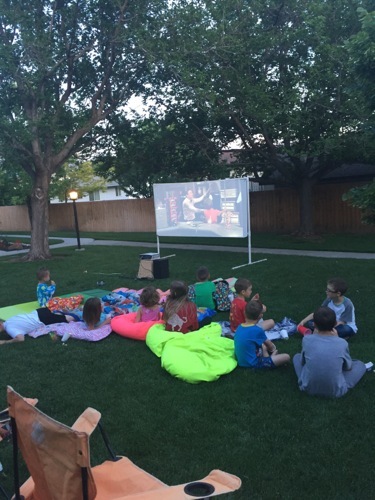 Went to the park with some of our favorite friends and then had our first neighborhood movie night of the summer. 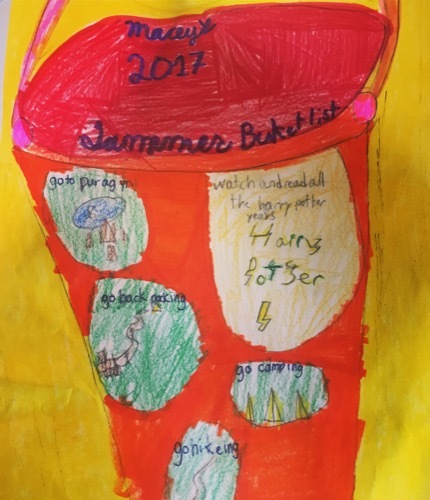 And Macey's summer bucket list made my heart happy. We've done something right and this is a bucket list I can get behind. Life doesn't get much better than summer days with these guys. We have been back in the swing of things for a few weeks now and it's been going smoother than I anticipated. 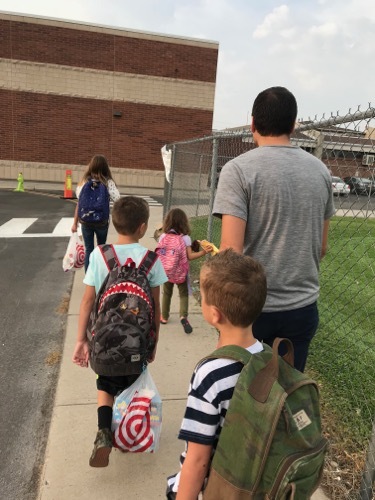 This summer was quite crazy and for the first time ever, I was actually a little bit happy for the kids to be back in school. Miles really wore me down this summer and having him in full day school has been quite refreshing. 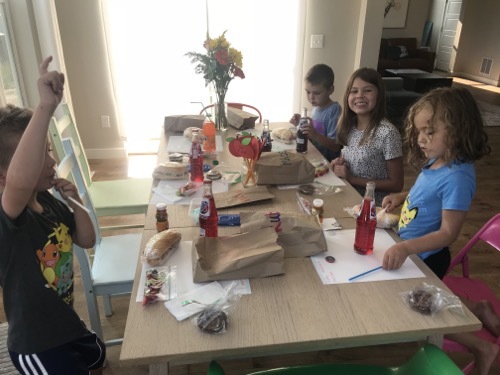 We got home from Bear Lake the day before school started, so I tried to get the kids to do Happy Meals for the back to school dinner. Shockingly, they refused, and wanted what we always have, brown bag lunches. Thank goodness I picked something simple from the beginning and didn't copy all those crazy pinterest people. Macey was all excitement to go back to school, just like always. 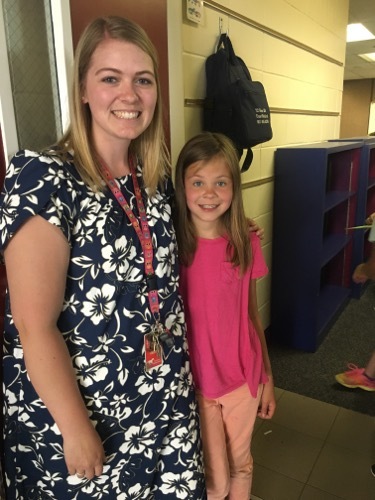 She has an amazing teacher and Macey was very happy to find out her new teacher loves Harry Potter just like her. 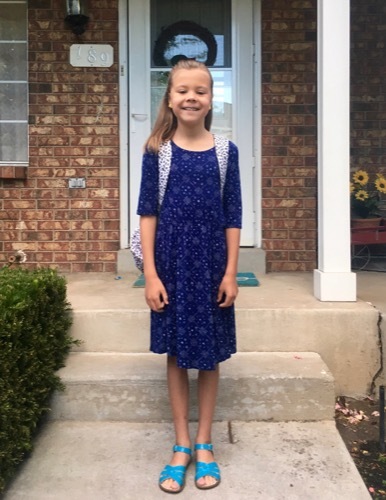 I cannot believe she is in 4th grade. Like really, can not believe it. This should not be happening. They did some assessments before school started and I was a bit nervous for Miles, remembering how horribly things went last year. This year was a huge improvement! 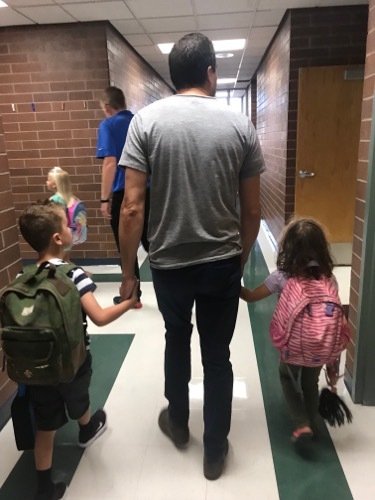 While I was the only parent that actually had to go in with their first grader instead of waiting in the hall, he at least spoke and communicated with the teachers and they were as kind and patient as could be. 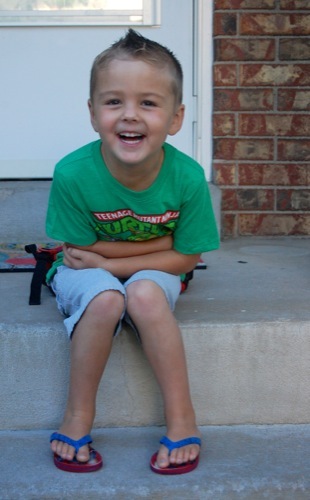 Miles told me he was only going to go to the first 2 days of school and the last 2 days. 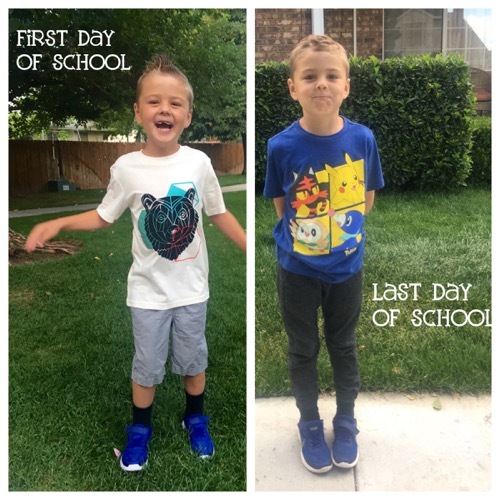 Luckily, he came home loving school and has gone back everyday since. 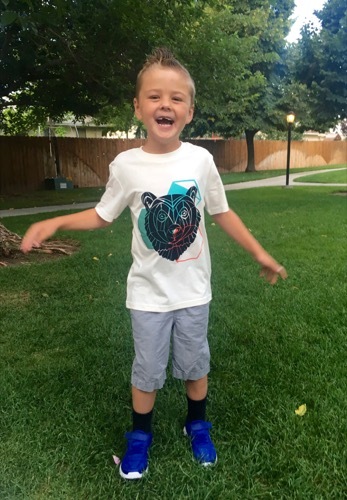 This kid has been dying to go to school His day finally came and it was all smiles and excitement. Ruby had to get in on his photo session. 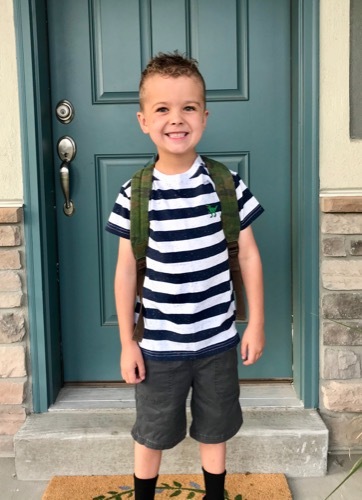 He went into preschool as happy as could be, posed for a picture, and then went and read books with the rest of the kids. I didn't even know what to do with myself, it was the first time in a long time I wasn't actually needed. I didn't even break a sweat. What a difference from Miles. These kids have the most amazing teachers this year and I am so grateful. You cannot replace a great teacher and I am thankful everyday for these teachers and the time and love they give these kids. And I am so glad I get this crazy one all to myself for a few more years. 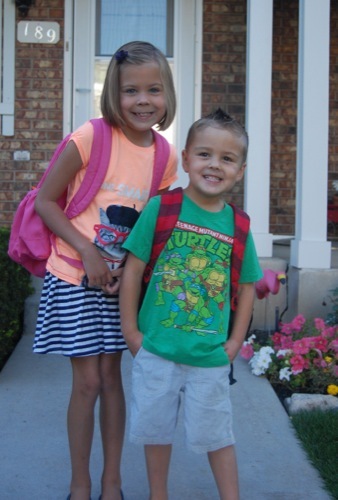 And, I need to report, this was the first year I did not cry sending the kids back to school! I am getting better at this letting go thing. Yay, back to school! 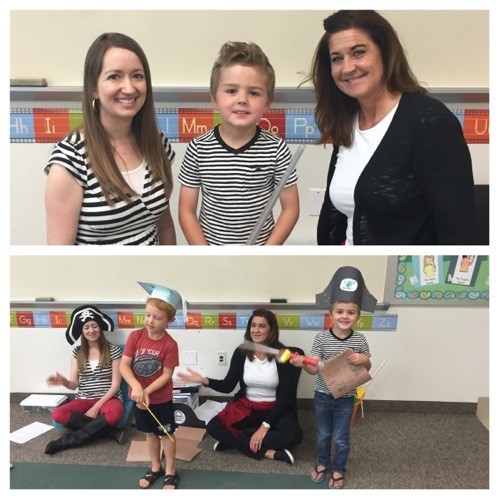 They are going to have a great year with their wonderful teachers. 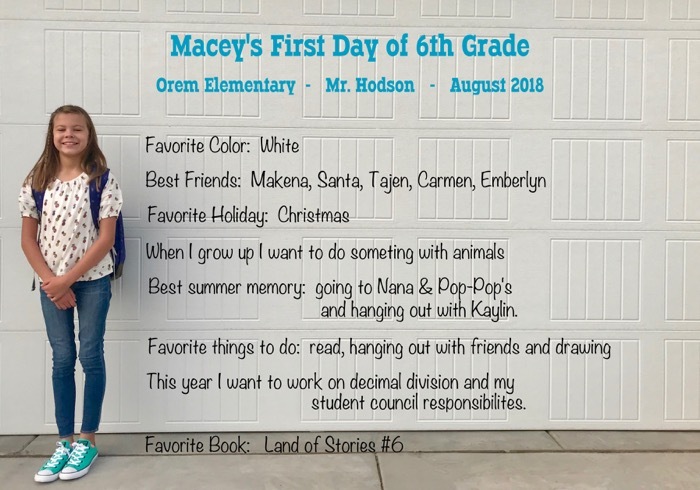 I love that Macey's favorite color has remained white since she was little. 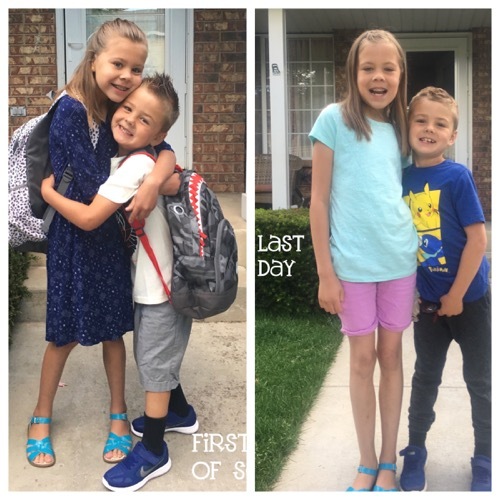 It has been an amazing school year for these two. 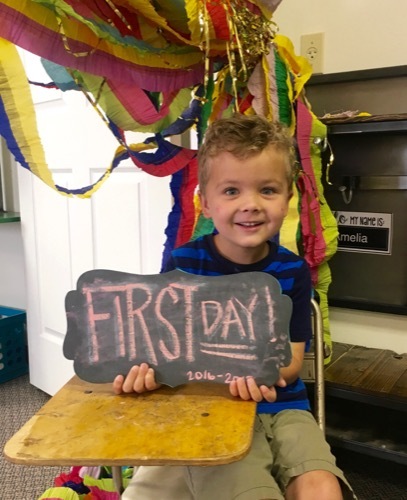 He pretty much had the best preschool teacher ever and I'm sure I'll be calling her next year crying and asking for advice. 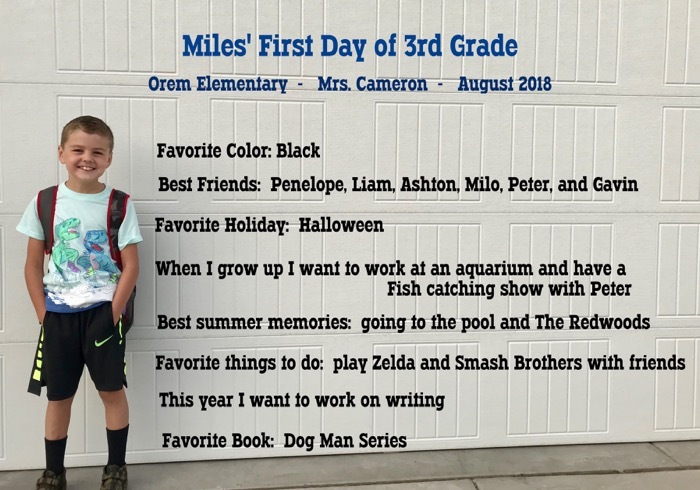 She's just one of those teachers that was able to see Miles for who he really was and was able to work with and motivate him in the most positive way possible. 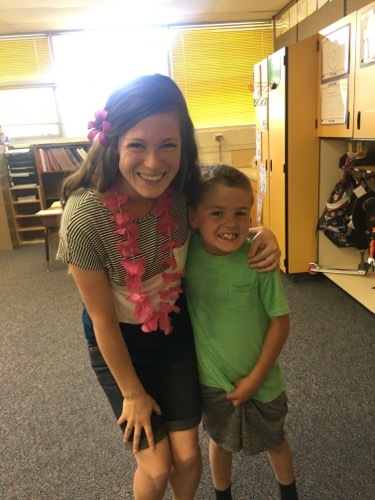 I seriously almost cried at the parent teacher conference having to say goodbye to her and having the fear that he might not be as lucky in the teacher department next year. We are also devastated to be done with Talking Time. Miles' speech has come so far from when we started almost 2 years ago. Once again he had some of the best teachers ever and I will miss them. They never got frustrated with him and just worked and worked to find out the best way to motivate and get him to perform at his full potential. 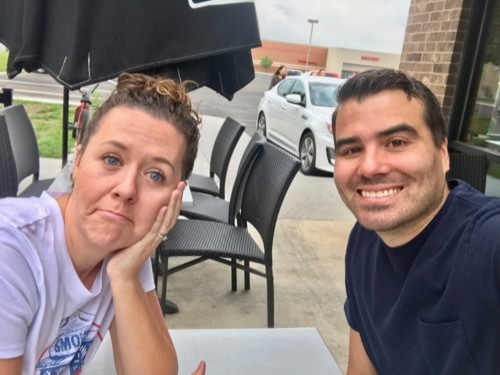 I have tons of anxiety about how he will do next year in a public school setting, but I've already met with the principal to discuss his needs and I really feel like they are willing to work with us! 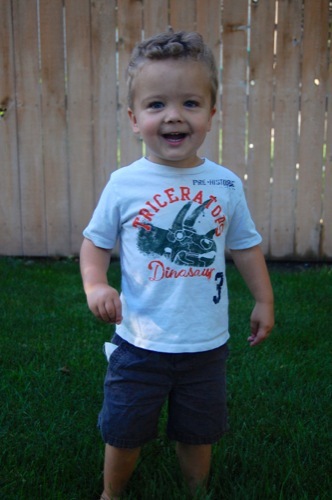 But really, who couldn't love this kid?!? 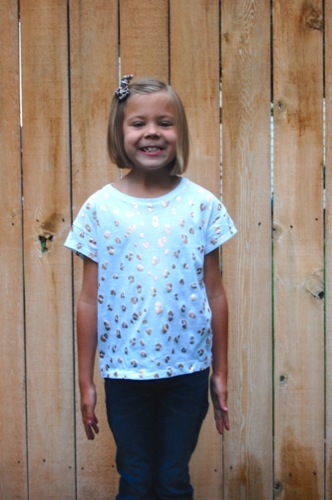 I CANNOT believe Macey will be a third grader! 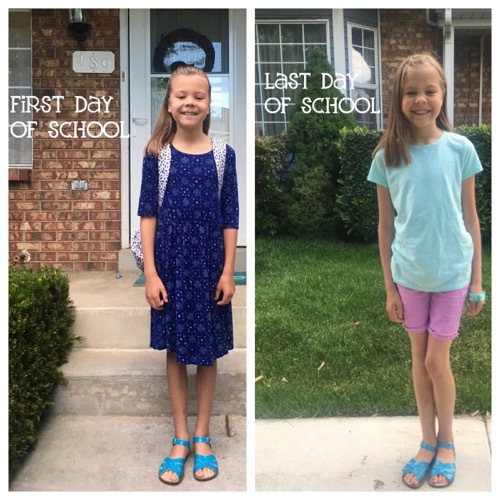 I of course shed a few tears after dropping her off on the last day of second grade. 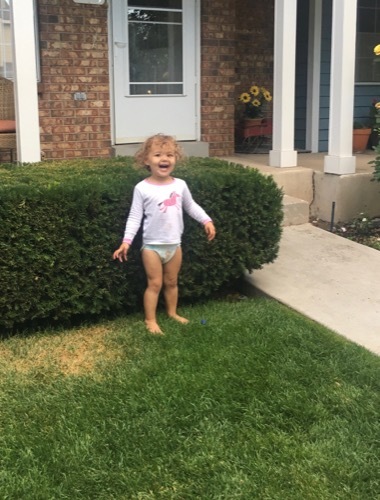 I'm am over joyed to have her home with me for the whole summer though and I guess I'll just have to make sure we have lots of fun, so she won't miss her school friends too much. I also have to document some of things I did for Teacher Appreciation Week. It was a crazy couple weeks getting ready, but I think it all turned out and I hope the teachers felt the love. 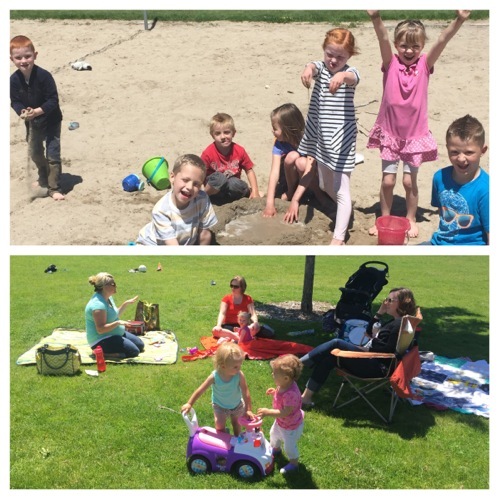 We celebrated school getting out by meeting some of our friends at our favorite park (meaning no swings) on the last day of school. 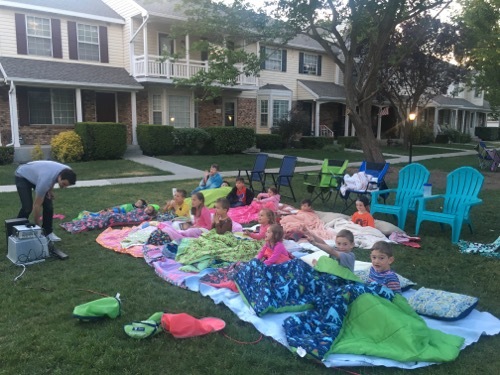 And then ended the day with our first neighborhood movie night. 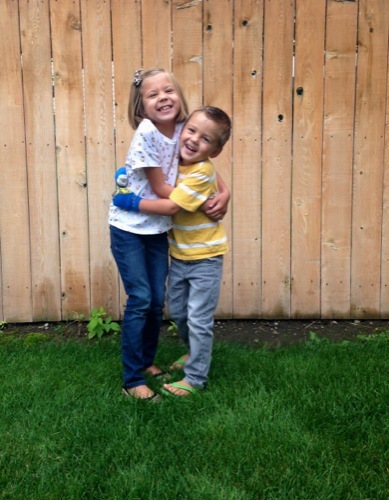 it's a good thing I love summer so much, or I might still be crying over the fact that these kids won't stop growing. You are a rock star mom. I admire how fiercely you fight for Miles' needs. It's really cool. I also love how completely you adore Macey and have such a close relationship with her. I can see that lasting for your entire lives. 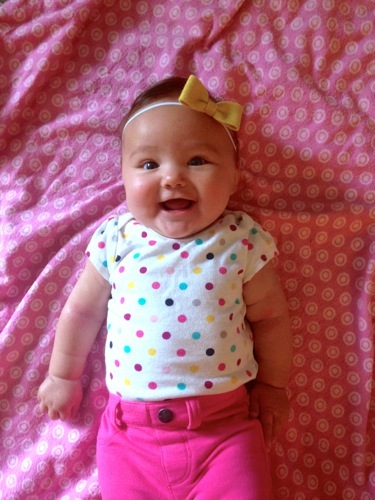 Macey changed a ton this last year. 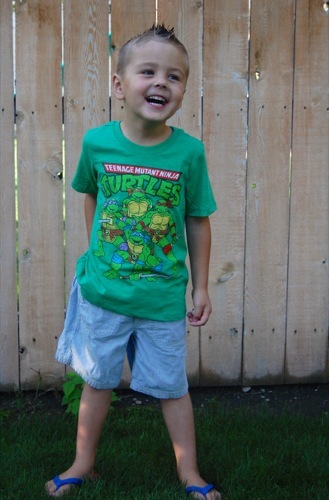 I love how Miles is always wearing his Ninga Turtle shirt. 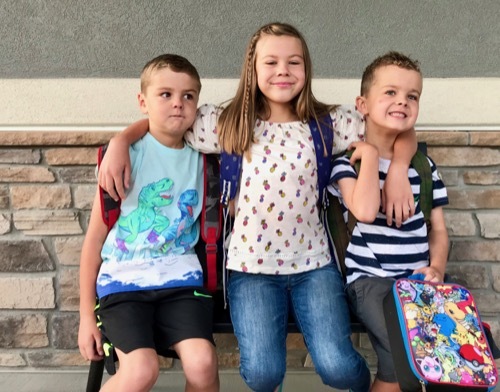 Miss Karli is a gem and she is so right about how smart Miles is. Macey changed a ton this last year. 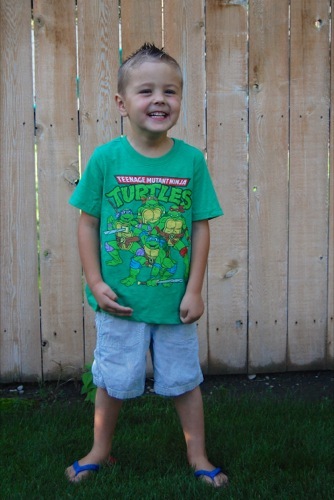 I love how Miles is always wearing his Ninga Turtle shirt. 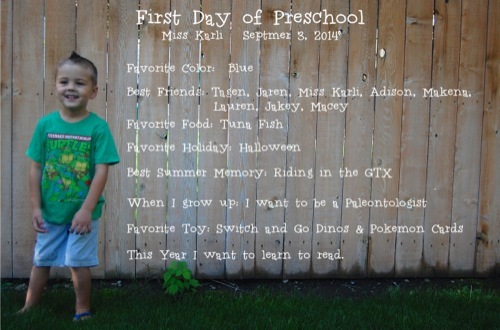 Miss Karli is a gem and she is so right about how smart Miles is. You did a great job on your doors and pop. 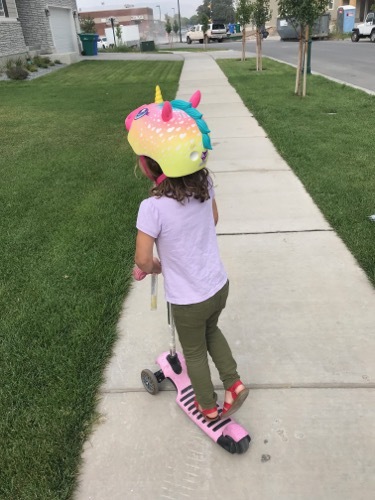 Your starting out with a great summer. I can be in denial no longer. 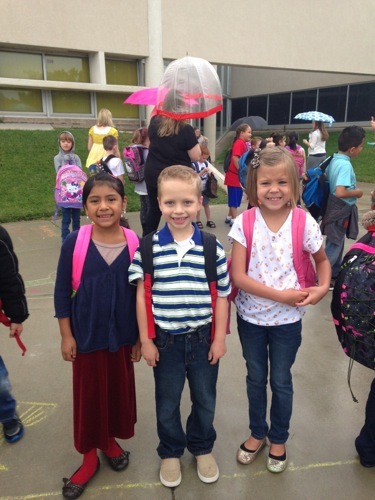 The new school year has begun! 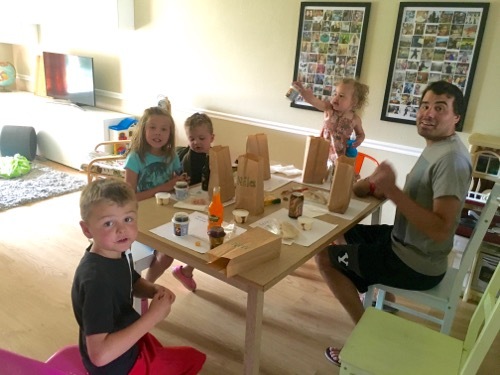 We had our annual brown bag back to school dinner. M&M loved it. Miles made sure "one of the special kids" got to say the prayer. Every year I go through my books and pick a few of my favorites to read those first few days of school. You know, to remind them to be brave, nice, grateful, and of course remind them that they are loved. 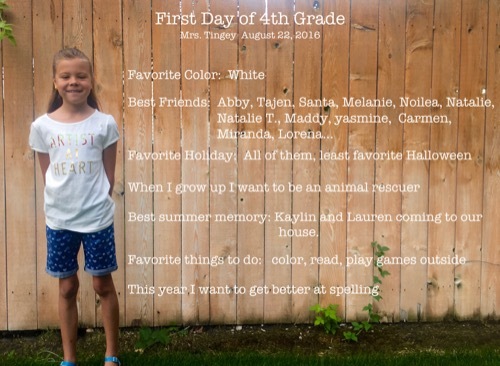 Macey started 2nd grade!! 2nd grade, as in the grade I used to teach!! I knew this day would come, but not this fast. There was very little apprehension from her this year. She's a pro at the school thing now. I of course cried the whole drive home from dropping her off. This year was easier on Miles too. 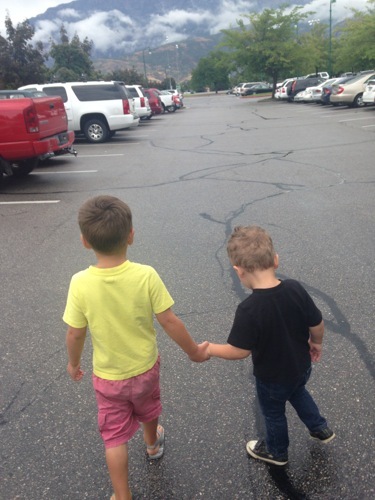 But man, these 2 just love each other and rarely fight. Some days are especially long for him as he waits for school to get out and homework to get done. 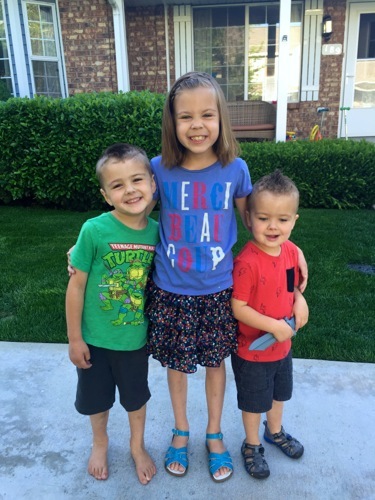 Macey also lucked out and got 2 of her favorite friends in her class this year. It's going to be another great year. And as Macey keeps telling me, "Mom, I'm in your favorite grade now!" 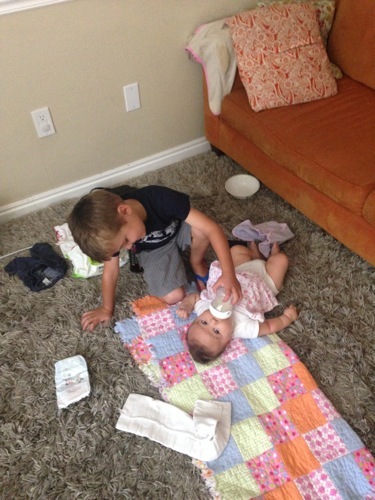 It's always hard for me to adjust to having Macey gone, since she's such a help with the boys. And I was seriously dreading, having nightmares, about how we would survive any outing without her. After we dropped her off, we went to the library and Miles said "Mom, I be your big helper now!". And he really was! Crew is a bolter, but Miles kept hold of his hand for me when I couldn't. He entertained Crew while I checked out our books. And he even watched Ruby in the stroller when I had to change Crew's diaper. And he is always the first to Ruby's side when she starts crying, which 90% of the time she stops the moment she sees him. 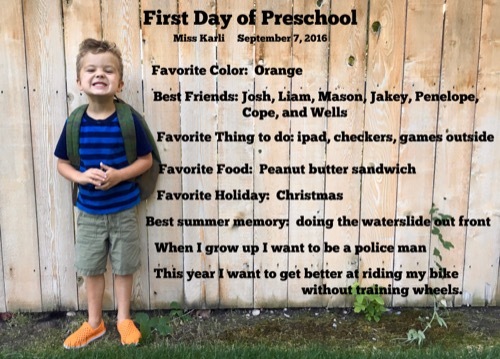 Speaking of Miles, he started preschool today. 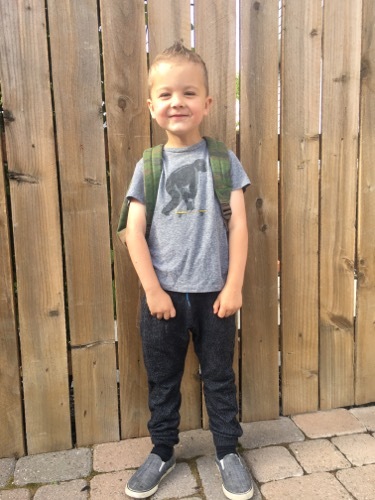 He is in the same preschool as last year, so it was all excitement and no nerves. Plus, he's been dying to wear this shirt ever since i bought it last month. 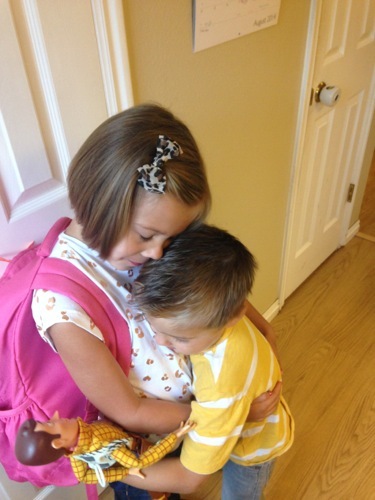 He has been missing Miss Karli all summer and has been counting down the days till he could give her a big hug. I still remember how heart wrenching it was on the first day of school last year to pry a crying Miles off of me and hand him over to Karli. It was no problem this year. 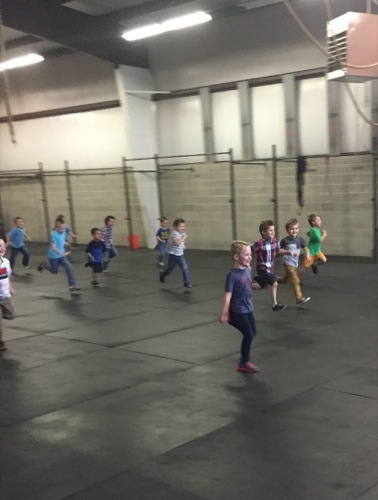 The best moment though was at pick up. Miss Karli was leading the kids out to sit on the grass to wait for their parents. I'm watching as all the kids walk out with their arms folded and trying to stay in a line, searching for Miles. I don't see him. Then all of a sudden a shoeless child with a backpack over his face comes running through the gate. Oh my gosh, it was hilarious. I just love this kid. I don't know why they think it's ok to keep growing, but they claim they can't help it. And Crew was not to be left out. While taking Miles' picture this morning he comes running over to me, "My picture too, Mama!" Good thing I still get him all to myself for another few years. And this girl, of course, too. You were made to be a momma. 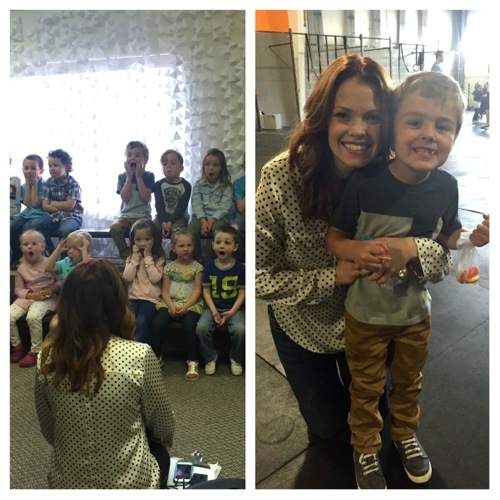 It's so fun to hear you talking about your kids. You are such a good mom! I love how you picked books to read them before school and the reminders for them. 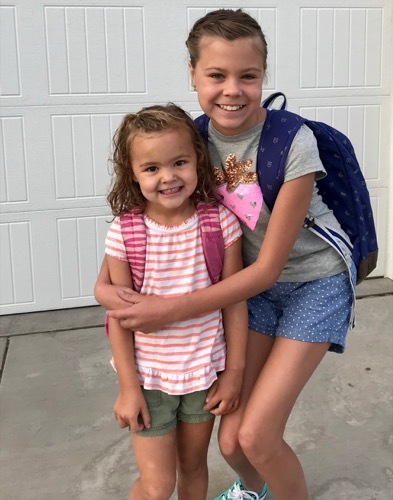 I agree they are growing way to fast and Macey should not be in your favorite grade yet. Holly I also love that Macey's favorite color is white, maybe because it goes with everything. Good thing you get Crew & Ruby for a bit longer. 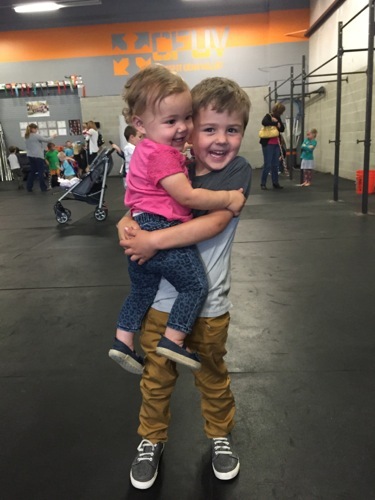 They are growing up way too fast! 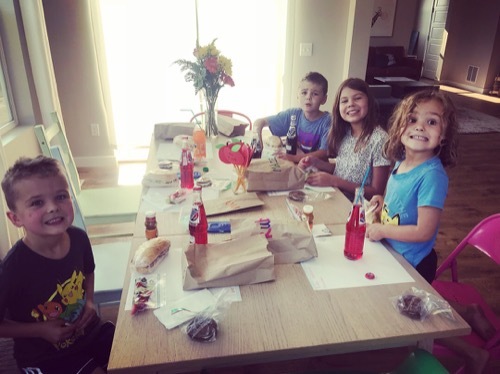 I look at our other 4 and 3 are teenagers and Brooklyn insists she's a pre-teen! Keep them little ss long as you can!